PINE MOUNTAIN, GA (May 25, 2008)--Competition at the prestigious 49th Masters Water Ski & Wakeboard Tournament concluded Sunday at Callaway Gardens on Robin Lake with amazing weather and thrilling competition throughout all disciplines. 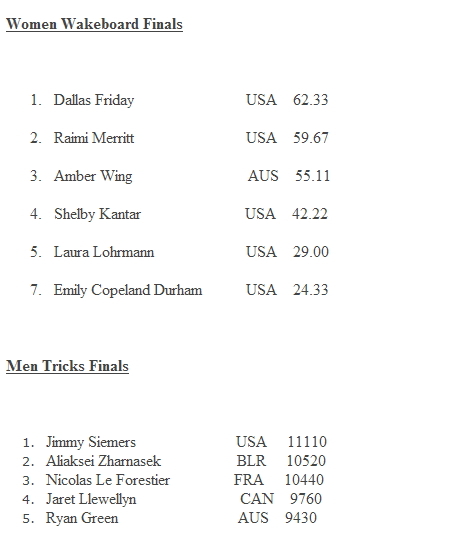 In women's tricks, Natallia Berdnikava was seeded last but that didn�t stop her from tricking 7330 points claiming her first Masters Women's Trick title followed by Clementine Lucine and Michale Briant. It was quite an interesting day in men's tricks where defending champion, Nicolas LeForestier tried to reclaim his title but Jimmy Siemers tricked an amazing 11,110 points earning this year's Masters Men's Trick title. Aliaksei Zharnasek followed with 10,520 points for second and LeForestier finished third, tricking 10,440 points. Regina Jacquess was victorious in the women's slalom discipline after facing April Coble Eller in a run-off. Eller ran into trouble early in her second pass, placing her second and Emma Sheers finished third. In the men's slalom event, Will Asher who was third off the dock set the tone for Chris Parrish and defending champion, Jamie Beauschesne with a run of 5@39-off, to claim the Masters Men's Slalom title. Beauschesne was just shy and ended with a score of 4@39-off placing second followed by Canadian Drew Ross who tied for third with Chris Parrish at 2@39-off. 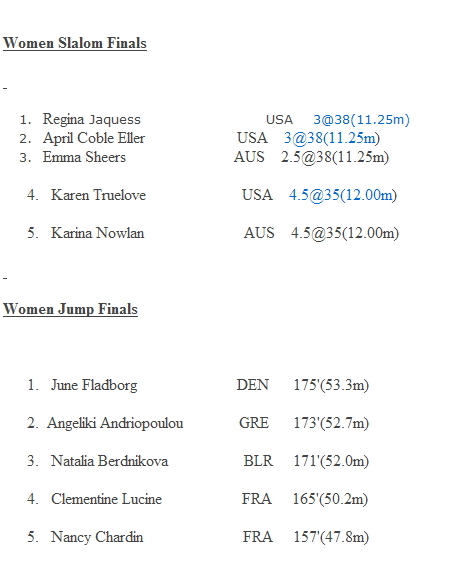 In the women's jump finals; June Fladborg from Denmark beat out World Jump Champion, Angelika Andriopoulou by six tenths of a meter to claim the Masters Women Jump title! Natallia Berdnikava followed close behind, finishing third. As always, men's jump was a nail biter bringing the crowd to their feet, as defending champion Freddy Krueger was last off the dock. 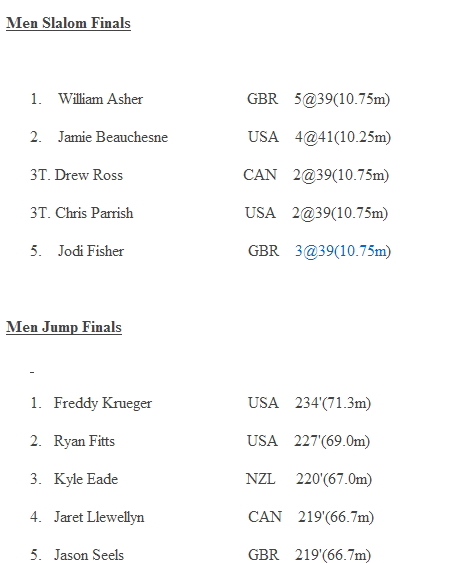 His first two jumps were not enough and it came down to the last jump of the day, Krueger soared 234 feet to claim his fourth consecutive Masters Men's Jump title! Ryan Fitts had a huge jump as well at 227 feet finishing second and Kyle Eade with a jump of 220 feet finished third. The women's wakeboard elimination rounds were completed this morning and in heat one, Dallas Friday set the tone for this afternoon's finals followed by Amber Wing and newcomer Shelby Kantar. 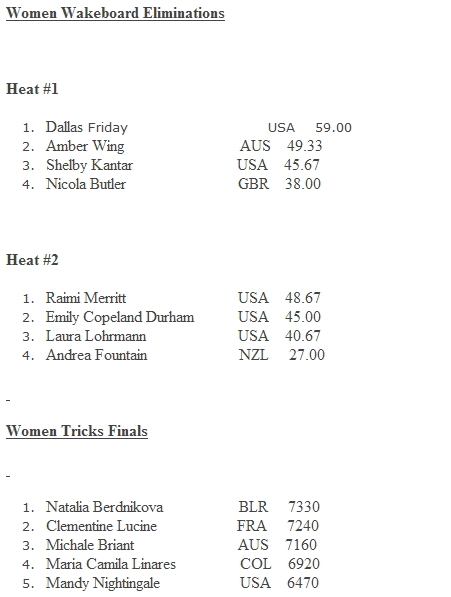 In heat two, Raimi Merritt made her second appearance at the Masters but this time as a pro claiming top seed followed by defending champion Emily Copeland Durham and Laura Lohrmann. In the finals, Friday was last off the dock and she earned the Masters Women's Wakeboard Champion title with a score of 62.33 edging out first year pro Merritt by less then 3 points who earned second and Wing placed third. It's definitely true what they say about third time is a charm and Rusty Malinoski proved it today in the men's wakeboard finals. Malinoski has finished the last two years in second place has finally earned his first Masters Men's Wakeboard Champion title and also won the $1000 Big Air Double Up by Roswell with a backside 720 crushing last year's defending champion Phillip Soven who was last off the dock and just missed retaining his title by less then four points followed by Andrew Adkison finishing third. The 49th Masters is produced by Nautiques by Correct Craft and officially sponsored by Acme Propellers, Callaway Gardens, Clarion, Mona Vie, PCM Marine Engines, Polk Audio, Trailer Boats and Zero Off. An invitation to compete in the annual Masters Water Ski & Wakeboard Tournament is universally considered an acknowledgement of achievement for reaching the pinnacle in a given watersports discipline - only the world's most elite athletes compete at the Masters. This tournament is IWSF/USA Water Ski and WWA sanctioned. Prize monies, trophies, rings and special event awards total well over $135,000. 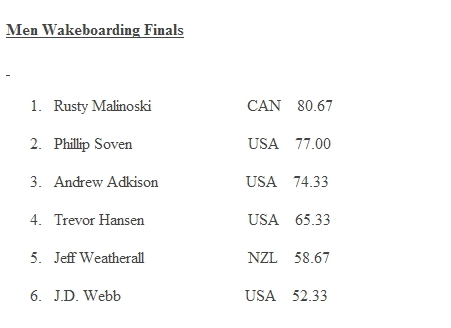 To view the results, visit www.masterswaterski.com.